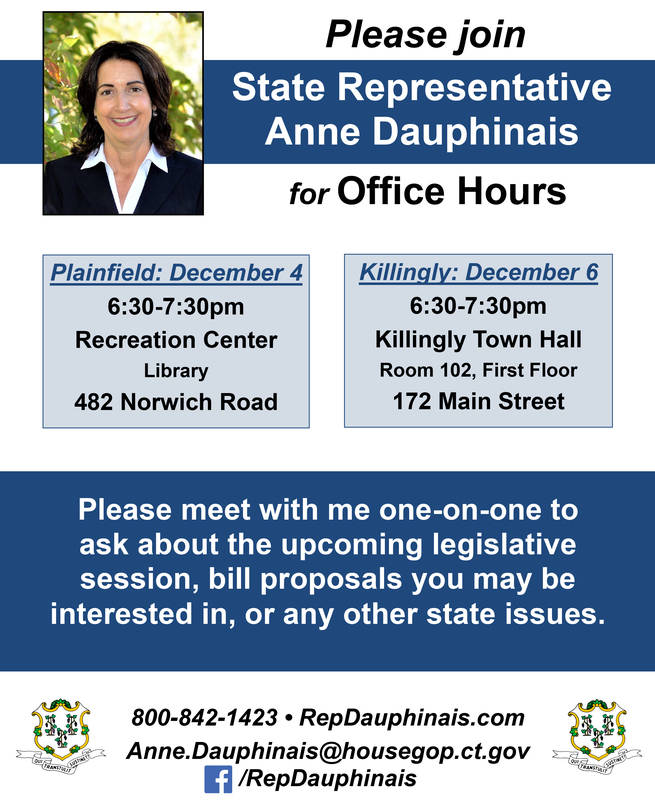 HARTFORD – State Representative Anne Dauphinais (R-Killingly) will be hosting office hours for Killingly and Plainfield residents who want to discuss the upcoming legislative session. The legislative updates will be held from 6:30 to 7:30 p.m. on Tuesday, December 4th and Thursday, December 6th at the Plainfield Recreational Center Library and Killingly Town Hall. Rep. Dauphinais will be hosting several other legislative updates throughout the session but wanted to give residents an opportunity to discuss issues prior to convening on January 9th, 2019 . Anyone with questions prior to the event are encouraged to call her State Capitol office at 800-842-1423 or email her at Anne.Dauphinais@housegop.ct.gov.